Great news, skyway-thletes! Condura Run is back! Although this time, they have re-branded it as CONDURA SKYWAY MARATHON positioning the race as a premiere marathon event in the Asia-Pacific Region by 2012. This is one of my MUST JOIN races for 2011. Heck, it’s one of my must join races of all time! I ran my first half marathon during this race and I did not regret it. Adrenaline and excitement were pumping in me that I totally enjoyed running on the Skyway experience. This will be the 4th Condura Run/Condura Skyway Marathon and just like previously, they have dedicated a portion of the race proceeds to help our preserve and protect our marine species. To date, they have contributed almost a million pesos for different marine advocacies. Last 2008, they bought radios for park ranger located in the Tubbataha Reef. On the year 2009, they donated to the construction of facilities for eco-tourism while helping protect our whale sharks. This year, we ran for the dolphins in Bohol. And next year, we will continue to run to help fund projects to protect our beloved dolphins. The upcoming Condura Skyway Marathon will have six (6) distances. Aside from the usual 5k, 10k, 21k and 42k, they will also have 3k and 16k. An assured P50 of the registration fee will go to the dolphins of Bohol thru the Ayala Foundation Inc. The race kit contains finisher medal for ALL distance categories, drift technical shirt, D-Tag timing strip, RFM loot bag and Hersheys Chocolate. Additional Coors Light Beer and 100 Plus loot bags will be given to all 21k and 42k registered runners. Are you in need of more giveaways? Then head to the booths of the following sponsors before stocks run out! Aside from the Condura Events Management Group, we have Coach Rio dela Cruz (awesome! ), Princess Galura and EKC + SME (Read: Ironman) as part of the team behind this event. The registration process is also very convenient. You can opt to go to the Asics concept store in Greenbelt 3 to register or register online at http://www.conduraskywaymarathon.com/registration/register-now/. 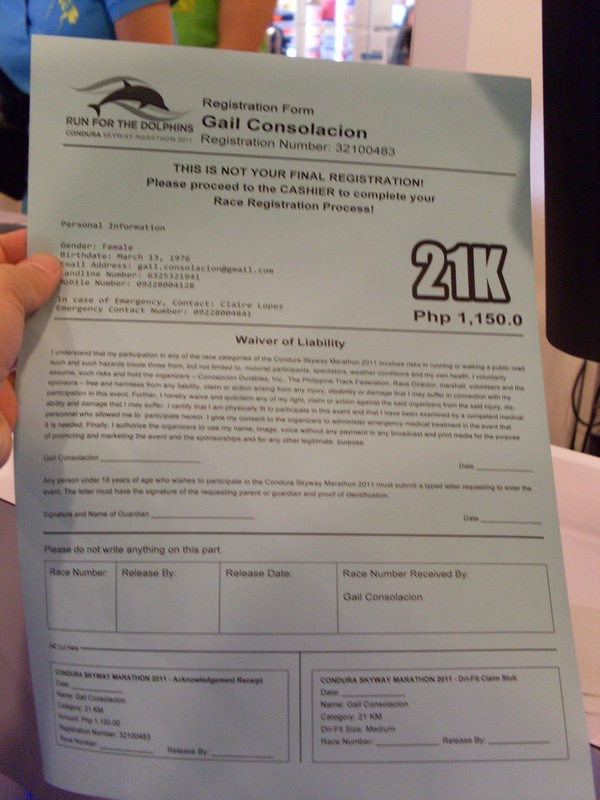 For participants paying via credit card, race bib and shirt will be mailed to your preferred address via Air21. But one has to pay additional for convenience so please expect an additional minimal fee for card and delivery charges. To make sure that the race can be handled safely and properly, the organizers had to put a cap on each race category. So please register now to avoid regrets of not being able to join the most anticipated race of the year 🙂 I am so excited! There’s also a cut-off for the 42k which starts at 3:30am. This would be 6 hrs and 30 mins. By 8:30am, the Skyway should be clear of any runners. Of course the kit came with Hershey’s bar, dri-fit shirt, race bib and the D-Tag. 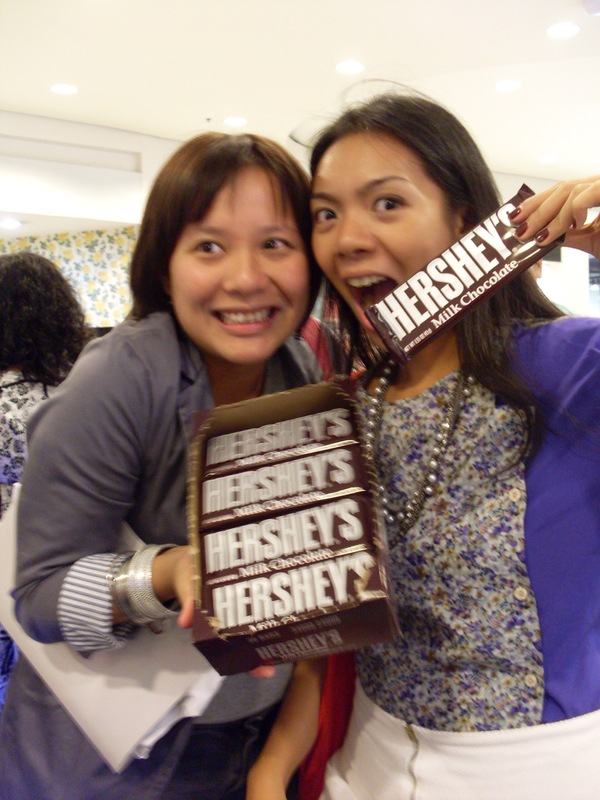 Abby and Kassy hoarding the chocolate bars. Haha! I can’t really wait to run this race. Running on the Skyway is very surreal! I assure you, this is worth every centavo spent.